If you lose a tooth or have multiple missing teeth, it can be upsetting. You may lack the confidence to smile or show your teeth to other people. Dental implants are the most natural and permanent way to replace a single tooth and multiple missing teeth. They can be used to replace a full set of missing teeth by fixing to the full set lower jaw and the full set upper jaw. Our leading dental implant surgeon, Dr Ash Deved is a qualified dental surgeon with over 20 years’ experience. He has been treating hundreds of patients throughout Kent including Bromley, Sidcup, Croydon, West Wickham, Crystal Palace, Orpington, Chislehurst, Hayes, Keston, Addington, Beckenham, Hazelwood, Chelsfield, Sevenoaks, Brasted, Chevening, Eynsford and Shoreham at the All Smiles Implant Centre. Treated for my complex dental condition by Dr Deved and his team, in every step received enough information. The clinic is always very clean and the staff are friendly and easily approachable. I would highly recommend, once again thanks everyone for looking after me. You can smile again with confidence! Find out why patients throughout Kent are thrilled with the results of their dental implants! If you are missing many teeth or missing a full set of teeth, the all-on-4 dental implants might be your best solution. 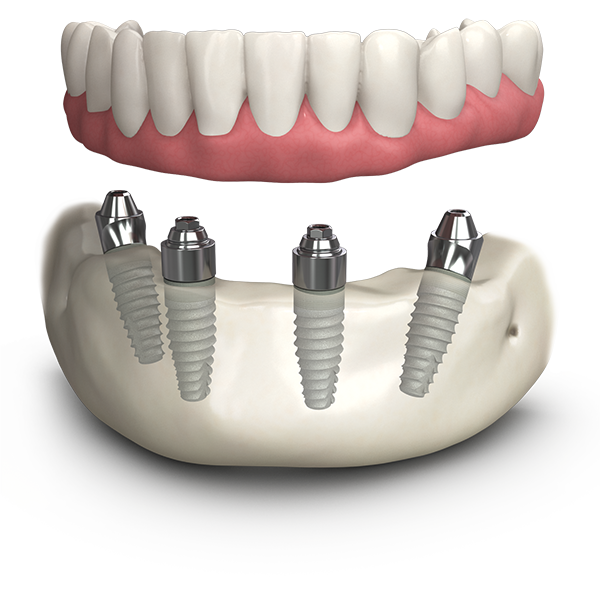 All-on-4 replaces a full set on the upper jaw and a full set on the lower jaw with just 4 implants. It often works out to be more cost effective and less invasive than having several single dental implants. If you and your dental implant surgeon decide that the all-on-4 treatment is the best solution for you, we can offer this as a same day procedure. This means you will get a brand-new set of teeth in just one day! Often, the reason why patients put up with decaying or painful teeth is because they are too frightened to visit their dentist. We understand that for some people, dentists and all things related to teeth are truly terrifying. Or perhaps you haven’t considered dental implants because you think the process sounds too complex and frightening. Our staff are all very professional and caring and are here to put you at your ease. Dr Ash is a qualified medical doctor, so rest assured, you’re in safe hands. We offer sedation for nervous patients or those suffering from dental phobias which will relax you. Many patients find dental implants to be expensive. There is no denying that the cost reflects the quality of the treatment and that dental implants, Bromley are built to last. The cost does vary according to each patient and can be discussed in more detail at your free consultation, but as a rough guide: A single dental implant will cost from £1,800. Fixed teeth for a full set upper jaw or a full set lower jaw will cost from £1,200. We offer flexible payment plans to spread the cost of the treatment from £55 per month. Please ask our staff at your free consultation. At All Smiles, we have treated thousands of dental patients and our dental implants are guaranteed for 5 years.